EURUSD is in consolidation for the downtrend from 1.1879. Range trading between 1.1574 and 1.1685 would likely be seen in a couple of days. 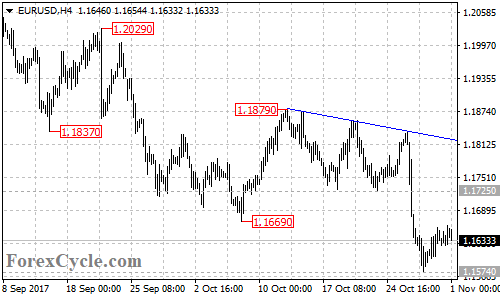 Near term resistance is at 1.1685, as long as this level holds, the downtrend could be expected to resume and a breakdown below 1.1574 support could trigger another fall towards the resistance-turned-support trend line on the weekly chart. On the upside, a breakout of 1.1685 resistance will suggest that lengthier consolidation for the downtrend from 1.2092 (Sep 8 high) is underway, then further rise to 1.1800 area could be seen.